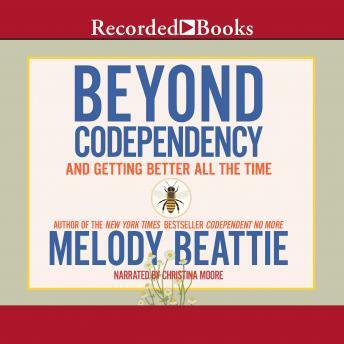 Author Melody Beattie's Codependent No More (RB#T1048) spent an astonishing three years on theNew York Times best-seller list and made "codependent" a household word. In this thoughtful sequel, she offers further helpful advice for making permanent, positive lifestyle changes. Alcoholism, drug abuse and similar destructive practices can render families dysfunctional. When the children of these families become adults, they sometimes develop self-defeating survival tactics, such as low self-esteem or an obsession with controlling another person's behavior. To help those stuck in codependent cycles identify and eliminate such troubling issues from their relationships, Beattie shares wisdom gained from years of experience. Beyond Codependency is a sensitive and supportive book that encourages listeners to adopt a practical approach when confronting their own unhealthy and unproductive behaviors. As she did with the original, narrator Christina Moore lends her reassuring voice to this important book.